Fly fishing is the act of hunting for fish using an artificial fly as bait to catch the fish. It dates back about 10,000 years, and has many different traditions and techniques, but, like most sports, has changed to keep up with modern technological advancements. Today it has become an ever-increasingly popular sport. With modern technological advancements, there have been more types of fly fishing flies for people to use. What exactly is being fished for and under what conditions determines the type of fly that is used. Although there are many different patterns that are used in fly fishing they can be broken down into five main categories: dry fly, wet fly, streamer fly, nymph and terrestrial. Dry Fly - The best known type is called dry fly fishing. This technique uses an artificial fly that is cast into the water, to float on top. 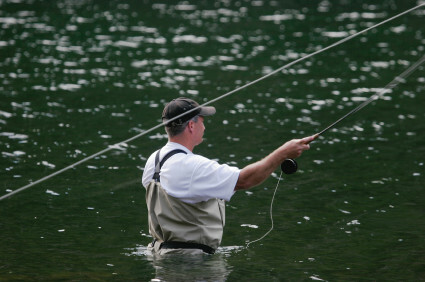 While fishing with a dry fly it is usually necessary to dry the fly several times. It is meant to look like an insect that stays on top of the water, and as it floats it will hopefully pass by a fish and entice it to come to the top of the water and try to grab it. Once the fish is caught on the hook it will try and wiggle itself off and in the process become tired enough to land the fish with a net. Wet Fly - As the name implies, wet flies are types of fishing flies that resemble insects that are under the water. This includes dead insects and insects that come up and emerge from the water. This type of fly can also be made to look like bigger water creatures such as leeches or crawfish to lure bigger fish. Streamer Fly - A streamer is a type of wet fly that is meant to look like an injured baitfish. Streamers are larger than the other types of fly fishing flies and are primarily used to catch larger fish that are predatory. Nymphs - Nymphs are what come out of the eggs that flies lay in the lake or river. They make their way to the surface and there they become a fly. These type of fly fishing flies uses different forms of nymphs that are weighted down to remain beneath the surface. You can usually land a few lazy fish this way if they aren't rising to the surface to feed. Terrestrial � These fly fishing flies can be used as wet or dry flies. They are made to look like larger insects that mistakenly jump into the water and drown. They can also be made to look like an insect trying desperately to free itself from the water or as an insect that has already died and is simply sinking into the water without movement. Because fly fishing has gained popularity, it has opened the door for more types of flies to be created and used to catch a variety of fish. Hopefully you find the best one for you.